Start 7.00 a.m. from Norton Summit (behind CFS building, opposite Scenic Hotel). These routes are scenically outstanding. Mild weather forecast with a strong chance of rain. Toilets at the start. Plenty of parking space north and south of the Norton Summit intersection. For afterwards, the Scenic Hotel. Turn left. After about 1 km you come to a junction.Take right turn into Third Falls Track. This joins Moore’s Track. Turn left. You come to an intersection with Chapman’s Track and Rocky Hill Track. Continue downhill for 1.5 kms along Moore’s Track, to a junction by a gate. Turn right into Fox’s Hill Track. After 2.1 kms, when almost at the bitumen road, turn right up the infamous Chapman’s Track. This takes you for 1.3 kms up a steep slope back to the intersection with Moore’s Track which you crossed earlier. Cross over it, and follow the Yurrebilla Trail signs along a broad sandy track. Watch out for a right-turn arrow into a goat track after about 1.5 kms. Starting from Cleland Wildlife Park carpark at 8.00 a.m.
North side of carpark near the toilet block. David Close will have printouts of the tracks to be followed. He recommends that you download the course to your smartphone or other device from the list of routes below. Some key junctions will be marked with red arrows. Help with putting them up and taking them down would be appreciated. For afterwards, the Cleland Wildlife Park cafe which opens at 9.30. Pictured: Mireen Track, one of several beautiful tracks to be followed. From the car park, head south, crossing the main drive just above the carpark into Gate 28, where the signpost is to Perimeter Track. Immediately afterwards, take a left turn into a maintenance track, which leads into a path signposted to the summit of Mt Lofty. About 1.3 kms from the start you join the Waterfall Gully-Mt Lofty Summit Track and turn left up it. About 200m later, you come to an intersection of this track with a broad vehicle track which is Chinaman’s Hut Track (not signposted here, but it is later on). Turn right into Chinaman’s Hut Track. Follow this track. On the way ignore various signposted turnoffs. After about 2 kms, at the bottom of a slope, you come to a T junction with Carro Track. Turn right, and you reach the junction with Mireen Track about 500m later. Turn left into Mireen Track. About 2 kms later, this joins with Birriee Track. Turn sharp left into this, and soon afterwards fork left into Carro Track. Follow this, and ignore the turnoff to the right into Chinaman’s Hut Track, which you came down before. You come back to the junction with Mireen Track which you passed before. This time turn right and go down a steep hill to the junction with the Waterfall Gully-to-Mt Lofty Summit Track. Turn right into this. About one km later, just after a bridge, fork left into Bilba Track. Go up this, and when you come to a junction, turn left into Perimeter Track. Follow this until you return to the carpark where you started. 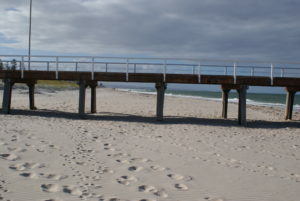 Start from Brighton Jetty at 7.00 a.m. to run south along esplanade to Marion Coastal Walking Trail, which starts at Marino. It’s 8 kms to the turnaround point at the cafe in Hallett Cove Conservation Park, and it’s an out-and-back run. From Brighton Jetty, 8 kms south to cafe in middle of Hallett Cove and back again. 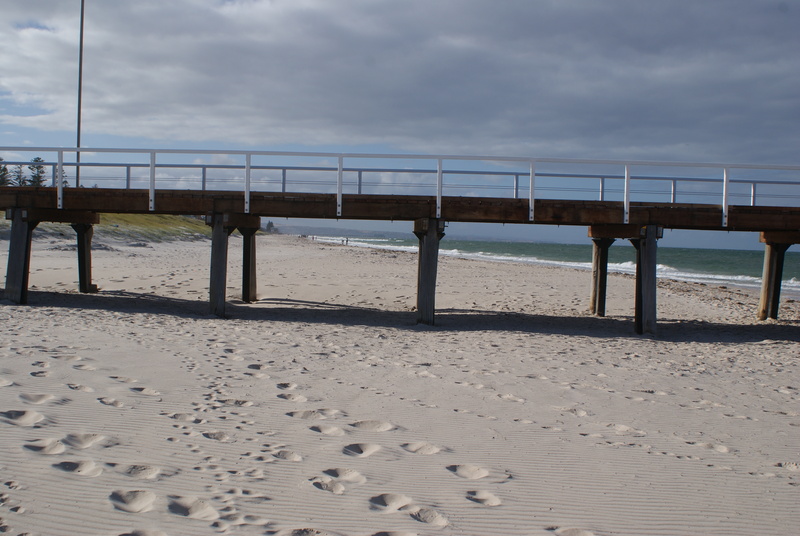 From Marino, this route is along cliff tops, mainly on the board walks of the Marion Coastal Walking Trail. There are many steps: total ascent/descent is 272m. The website for the Marion Coastal Walking Trail contains information about the geological features and public art to be seen along the trail.